Reports of fighting during the month of July related to the battles in and around Warsaw and in the Dardenelles. The major offensive in the west had to do with the FFrench offensive in the Vosges Mountains. The idea ought not to be new to Americans at least. For many years it has been argued, with eloquence and with a convincing array of historical and scientific facts, by David Starr Jordan, president of Leland Stanford university. His little book, “The Human Harvest,” printed eight years before, has given the reading public a chance to familiarize itself with the idea. And yet he has met with slight response. That book may be famous in the future, as the first clear expression of the biological truth of warfare. Dr. Jordan’s argument is that through all history we may trace the decline and fall of nations and races to the destruction of their best and strongest men in war, generation after generation, and the perpetuation of the race by weaklings left at home. Thus, he maintains, the natural vigor of a race is corrupted. It deteriorates physically, mentally and morally. It loses its capacity for independent action and thought. From being a world power, it may sink to a position of inconsequence and subjection. Germany itself had an opportunity to familiarize itself with the theory. The year before the war began Dr. Jordan lectured among the German universities on this very subject. But he met even less interest and cordiality for his views than he had met in America. The Germans had been brought up on the “blood and iron” philosophy of Bernhardi and Treitschke. They were absolutely certain that war is what the militarists have always maintained, “a biological necessity.” They believed the old theory that warfare has always served a salutary two-fold purpose in rousing the spirit of nations and in weeding out the weak. Prussianism fitted in with the biology of the brute creation in insuring the “survival of the fittest” in the struggle of armed nations – the fittest individuals as well as the fittest nations. And now, we are told, scholar and peasant alike have learned the bitter truth that war means the survival of the least fit and the decay of the race. The old argument may have held true in the old days. When men fought in primitive combat it was doubtless the strongest who bore down opposition with his club or battle-ax or spear or broadsword. But we are long past that hand-to-hand aspect of war. Modern rifles and machine guns and cannon can be fired by weaklings as well as by athletes. And the bullets and shells are blind – they mow down a giant or a genius as readily as they do a man worth little physically or mentally to his generation or the future race. In fact, as Dr. Jordan has always insisted, it is the strongest and the ablest who go first, especially under present conditions. It is they who lead the charges, to be swept down by torrents of lead and steel, while weaker comrades press after them to victory. And worst of all, it is the young men who are now being slain by millions. Mr. Irwin points out that in the belligerent countries all the able-bodied men between 19 and 45 are in the ranks. But it is the younger men who do the fighting. Those in the forties and late thirties are guarding the lines, garrisoning the towns, attending to the transportation of supplies. The overwhelming majority of the dead, he declares, will be found to be less than thirty years old, and probably the majority are under twenty-five. That means that the millions slain or made helpless wrecks are mostly not only the strongest in physique and moral courage, but they are unmarried. They go to their death without leaving any children. It would really be better for the race, however brutal it appeared, if the aged and middle-aged were sacrificed and those young men were saved to become the fathers of families. “The undersized,” says Irwin, “the under-muscled, the under-brained, the men twisted by hereditary deformity or devitalized by hereditary disease – they remain at home to propagate the breed.” And from that it is easy to foresee the inevitable decline of Europe. There is as of yet no comprehensive listing of casualties by month. There is an informative timeline available here which describes in a timeline format British Commonwealth casualties, placing the casualties in a context that compares casualties with civilian populations. You can select any given day and find out how many casualties there were, broken down by unit and service. The demographic consequences of war were dramatic. The deficit in births in some countries equaled the military casualty rate. 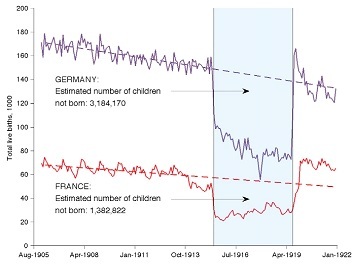 The following graph by Guillaume Vandenbroucke illustrates the impact of the war on birth rates.